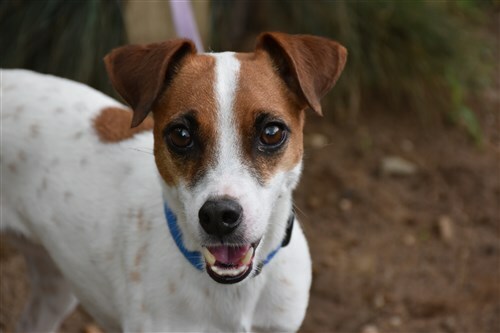 Toby is a 4-year-old tricolor, smooth coat male Jack Russell with an undocked tail, who weighs 12 pounds. This energetic boy came to us because he was chasing after the cat and not getting along with the other male dog in the house. He was very much loved, and is very affectionate. Toby has tons and tons of energy, and is VERY prey driven. There certainly will be no small wild critters safe when Toby is on the trail. 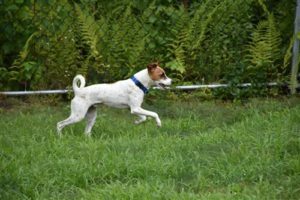 This JRT is housetrained, extremely smart, does well in the crate, and rides wonderfully in the car. Walking this little dog is definitely a way to keep fit, and he would profit from participating in some sports such as agility, go to ground; and I can assure you he would be great at nose work. Toby would benefit from a fenced in yard, and he needs to be an only dog. A wonderful companion for someone who has lots of love to give, is physically active and would enjoy a squirmy happy little jack. Another added benefit? Toby’s pretty darn cute! Don’t let this little Jack Russell run away from you; he’s quite the catch!